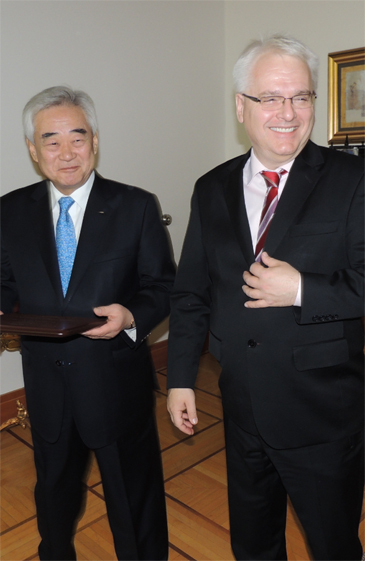 Croatian President Ivo Josipovic (right) makes a broad smile as he receives an honorary 9th-dan black-belt certificate and a dobok (Taekwondo robe) from WTF President Choue Chungwon at his office on Nov. 14, 2014. Croatian President Ivo Josipovic (right) received an honorary 9th-dan black-belt certificate and a dobok (Taekwondo robe) from WTF (World Taekwondo Federation) President Choue Chungwon in a ceremony at the Croatian President's office in Zagreb, Croatia on Nov. 14, 2014. The ceremony was joined by other dignitary participants including North Korean IOC Member Chang Ung, South Korean Ambassador to Croatia Suh Hyung-won, and Prof. Franjo Prot, president of the Croatian Taekwondo Federation. The WTF was established on May 28, 1973 at its inaugural meeting held at the Kukkiwon with participation of 35 representatives from around the world. There are now 205 member nations. Since 2004, Chungwon Choue has been the president of the WTF, succeeding the first president, Un Yong Kim, after he retired. On July 17, 1980 the International Olympic Committee recognized the WTF at its 83rd Session in Moscow. First, Taekwondo was adopted as a demonstration sport of the 1988 Olympic Games in Seoul, Korea; later, on Sept. 4, 1994 Taekwondo was adopted as an official Sport of the Sydney 2000 Olympic Games at the 103rd IOC Session in Paris, France. According to the WTF, "Taekwondo is one of the most systematic and scientific Korean traditional martial arts, that teaches more than physical fighting skills. It is a discipline that shows ways of enhancing our spirit and life through training our body and mind. Today, it has become a global sport that has gained an international reputation, and stands among the official games in the Olympics."